← Mushroom Cap jelly found in the Chesapeake Bay.. 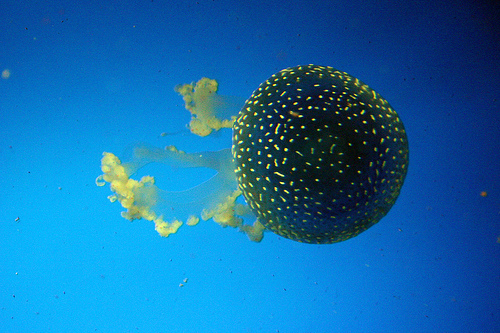 The Sun Jellyfish a member of the marine life species that is very unique. This Jellyfish is a species belonging the scyphozoan class of marine life in the invertebrates. The name of scyphozoan is derived from the Greek name “skyphos” meaning “a drinking cup” and is used to describe the jellyfish based on their shape. They have a lifetime about three to six months. They have a small sensory organ located near its bell. This organ is called the rhophalia. They use the rhophalia identify odor and light. They do not have shells or scales so when they are exposed to the sun they seem to disappear, leaving only a filmed circle. Due to their invisibility in the sun, this jellyfish can be dangerous to humans as their sting is extremely painful and attributed to various allergies in humans.